Over the past several years, online video and music streaming services have become increasingly popular. Accessing digital media over the Internet is convenient and inexpensive for most people. Unfortunately, not every location gives Internet users equal access to the same shows and music. Unblock-Us.com is dedicated to helping customers easily access content available on georestricted websites. The company provides a secure service to customers all over the globe seeking greater access to online media. Unblock-Us.com is a fast, reliable VPN service that allows customers to mask their geolocation data when visiting certain sites. In other words, Unblock-Us members are able to access region restricted websites. This service allows customers from around the world to download and stream content that would be otherwise unavailable in their country. Unlike most VPN services, Unblock-Us.com does not mask a member’s location by changing their IP address. Instead, the company routes DNS queries through its own servers without logging or analyzing any data. Unblock-Us promises to protect the privacy and security of its customers. Customers can subscribe to use Unblock-Us.com for the low price of $4.99 per month or $49.90 per year. Paying members gain access to the dozens of channels supported by Unblock-Us.com and an expert customer support department. Unblock-Us.com offers customers a free 7-day trial of the website before signing up for a monthly or annual membership. Visitors can become familiar with the simple, user-friendly interface of the website and explore the different channels that are available. This free trial does not require any payment information, so a customer will not be charged if he or she forgets to cancel the trial membership in time. Customers can use Unblock-Us.com to stream or download content onto a wide range of devices. Not only can members access region restricted websites from their computer, but also from their mobile devices, smart TV’s and even gaming systems. Customers are able to set up Unblock-Us.com services directly through a device, or set up their router to access content through multiple devices. Unblock-Us.com provides convenient step-by-step guides that even a computer novice can use to easily set up the VPN service on any device. Guides for everything from PlayStations to Android phones are available through the company website. Recently, Unblock-Us.com introduced their new Unblock-Us everywhere service. Now members can use the site’s services in places that were previously blocked, including areas where ISP’s hijack your DNS queries, hotel Wi-Fi networks, and 3G networks. This service is currently available on mobile phones, tablets or PCS. All customers that subscribe to Unblock-Us.com are able to participate in the website’s affiliate program, which is a quick and easy way for members to earn some extra cash. Customers that operate a blog, social media page or other website can place a link to Unblock-Us.com for friends and followers to see. Affiliates earn a small commission on any business that they generate for the website. Payments are made monthly after a $50.00 minimum has been reached. 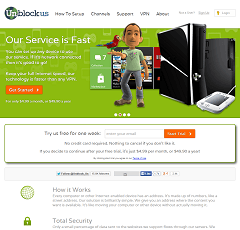 The Unblock-Us.com team is focused on providing superior service and maintaining excellent customer relations. 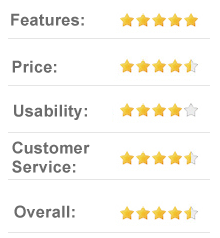 Website ratings are transparent and open to public scrutiny. Each time a customer interacts with the Unblock-Us support staff to resolve an issue, he or she is given the opportunity to rate the experience as positive, negative or neutral. This can not only help a potential client decide whether or not to purchase a subscription, but also helps Unblock-Us.com to monitor and improve the quality of their customer service. For the latest information about new channel additions and website updates, members can visit the Unblock-Us.com Facebook or Twitter feeds. Customers can also find out here how to enter website contests and giveaways to win prizes. Unblock-Us.com offers VPN services that are compatible with almost any device, and provides users with helpful setup guides. Linux users may be disappointed to find that while the Linux system is supported, there is no step-by-step guide to help Linux users set up Unblock-Us services. Customers may also be frustrated by the fact that certain channels are only available on certain devices. Some websites can only be accessed with desktop computers, while others may also be accessed from additional devices such as a mobile phone or a gaming system. If any website requires a paid subscription, a customer must pay for that separate subscription before they are able to access the site via Unblock-Us.com. The Unblock-Us.com customer support team is available 24 hours a day, 7 days a week. Customers can email questions and concerns to the customer support department using a convenient webform. Members can expect a representative to respond promptly and professionally. The website also give customers the option to seek assistance through forum based support. Members can ask open questions to other website members and receive tips or advice on how to use the Unblock-Us.com VPN service on a device. [+] How can I save money on my Unblock-Us.com subscription? Customers that commit to an annual membership save about $10 compared to customers that pay monthly. [+] Which payment methods does Unblock-Us.com accept? Unblock-Us.com accepts Visa, MasterCard, JCP and Diners Club International. Customers can also make payments through PayPal. [+] What currency does Unblock-Us.com use? Unblock-Us.com accepts payments made in U.S. or Canadian dollars. [+] Does Unblock-Us.com charge a cancellation fee? No, there are no cancellation fees for Unblock-Us.com customers. Members can contact customer support regarding a refund. Why Should I Use Unblock-Us.com? Unblock-Us.com is a fast, secure VPN service that allows customers to access region restricted content across a wide range of devices. Unblock-Us is compatible with most PC’s, mobile devices, smart TV’s and gaming systems. With the new Unblock-Us Everywhere service, customers can now mask their geolocation data in even more locations, including anywhere in range of a 3G network or when using hotel Wi-Fi.